With my recent forays into Ethiopian cooking, I've become interested again in revisiting teff for the first time in many years. 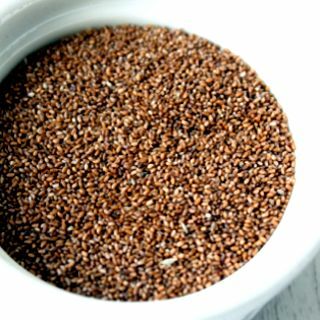 Teff has been the staple grain of Ethiopian cooking for thousands of years but is relatively unknown to the rest of the world except through the sourdoughed teff flour flat bread called "injera" that is served in every Ethiopian restaurant. But it is available in larger grocers and in health food stores from brands such as Bob's Red Mill. And its obscurity certainly doesn't hide its unique qualities. So very tiny that its name actually translates as "lost", it has a rich brown color and a much more robust earthy and nutty flavor than any other grain. And it's a nutritional gluten-free powerhouse of protein, calcium, iron and fiber. Teff has a thick, chewy and gritty polenta-like consistency when cooked up and makes for a distinctive — and healthy — breakfast porridge. 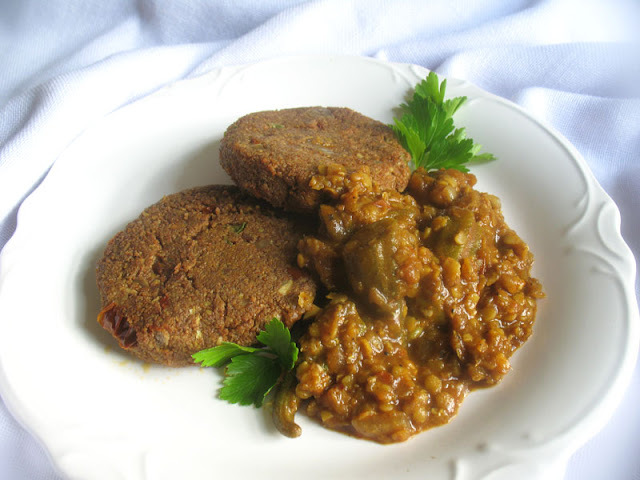 But on the dinner table, its robust flavor makes it less a platform for seasonings and vegetables than other grains and more of the starring flavor. So teff is a perfect vehicle for making savory cakes like the kind I like so much. 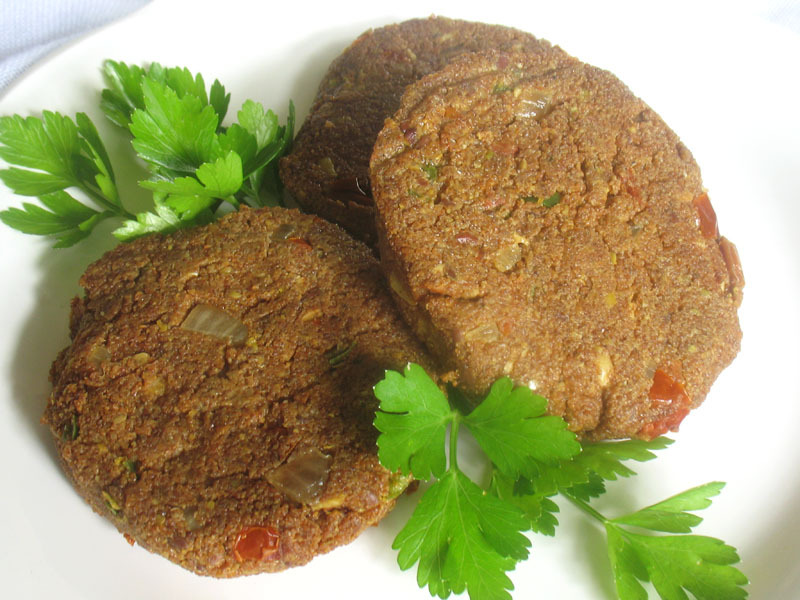 Combined with Ethiopian spices, chilies, sun-dried tomatoes and a raw cashew paste, this thick cooked grain molds into burger-size patties that can be baked or fried for a bold tasting side dish that might just turn out instead to hog the spotlight on your dinner table. In a large heavy-bottomed saucepan, bring the water or stock, 1/3 cup of the nutritional yeast, turmeric and half of the garlic to a boil. Slowly pour the teff into the water, whisking. Reduce the heat to low and cook uncovered, stirring frequently and scrapping the bottom of the pan to ensure the teff doesn't stick, for about 25 minutes until the liquid is absorbed. Remove from the heat and set aside for 5 minutes. While the teff is cooking, make up the paste. In a small blender or food processor, grind the flax seed. Then add the the cashews, almond or hemp milk, coconut oil, berbere, cumin, paprika and salt. Process until a thick paste is formed. Add a little more almond or hemp milk if it is too thick to blend. Transfer the cooked teff to a large bowl. Stir in the remaining nutritional yeast, garlic, red onion, jalapeños, sun-dried tomatoes and cashew paste. Mix until well combined. Let cool to room temperature, then cover and refrigerate for at least 5 hours or preferably overnight. 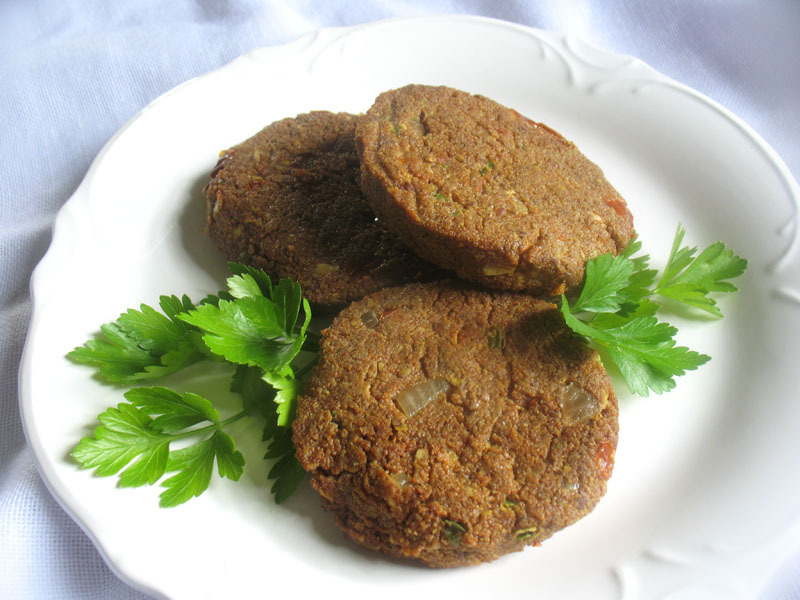 Shape the mixture into 2-inch patties. If the mixture seems to moist, stir in a few tablespoons of chickpea flour. To fry the cakes, heat a few tablespoons of oil in a large skillet over medium-high heat. When hot, add a few of the cakes to the pan, taking care not to overcrowd the pan. Fry for about 5 minutes until golden brown then flip and fry for another 4 minutes. Drain on paper towels and repeat until all the cakes are cooked. To bake the cakes, line a baking sheet with parchment paper and preheat an oven to 375°. Place the cakes on the prepared sheet and bake for about 20 minutes until the cakes begin to brown. Carefully flip and bake for another 15 to 20 minutes until golden brown on both sides. Remove from the oven and let sit for another 10 minutes before serving. I definitely want to experiment more with teff outside of injera. These patties look so good!